The Bobbilicious Files: The Votes are In! Thank you for helping me choose a sweater pattern! The winner is Tubey. I've looked at it on ravelry and it seems to be a quick knit that looks good on everyone. Originally I was going to make it in Ravenclaw colors but I found some great red-pink in my stash that will be perfect. Of course, I need to finish the gifts first - just a little more. Jenny and I had a conversation recently about sock yarn - what a shame it is to make beautiful socks that no one will see. From now on my gorgeous yarns will be items for my upper body. 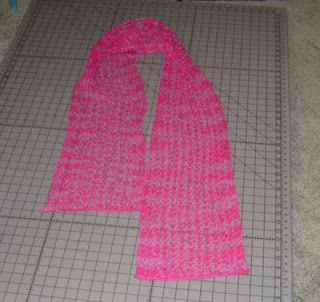 I just finished a nice pink lacy scarf out of Artyarns Ultramerino. I love it. Now I'm making a lace scarf out of wool-silk that I handpainted. It's so soft and squishy and wonderful. Yes, I'm on a lace scarf kick right now. Got any patterns to share? I'm looking for easy ones that I can memorize quickly and relax to without messing up if I watch TV or talk to someone. Not much else is going on. Although I need to ask a favor. Next month is my birthday, and it's a big one - the kind they make black plates for. I would love some encouragement and comforting words. I've never felt my age until recently - this pain problem makes me feel so old and decrepid. If you can boost my spirits I will love you forever. Aw, never look at numbers. You're as old as you feel. And don't forget, everyone feels achy now and then. That's what's stretching is for. I Need A Favor, Please!